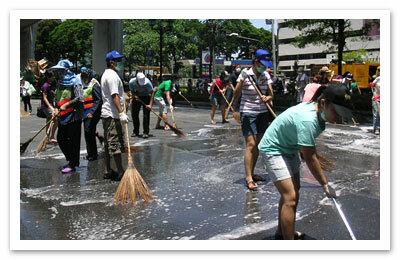 On May 23, 2010, the Bangkok Metropolitan Authority held activity called “Bangkok Big Cleaning Day” for people to join cleaning up six streets affected by the red shirt demonstration. The opening ceremony started at 9 am at the King Rama VI monument, the gate to the Lumpini Park. Estimated volunteers in the activity were 5,000 people; families with kids, teenagers, celebrities, elderly people or even foreigners. Many volunteers brought their own cleaning supplies such as gloves, brooms, dust pans, trash bags, etc. 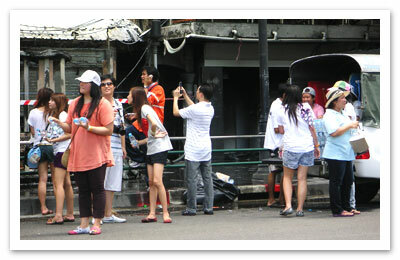 and joined the effort to bring Bangkok back to normal. Many do not mind dipping their hands into sewers to remove the filth. 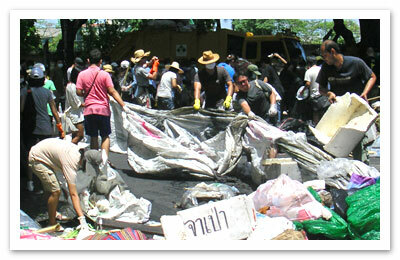 Some were willing to collect piles of garbage swarming with files while others were busy scrubbing roads and signs. 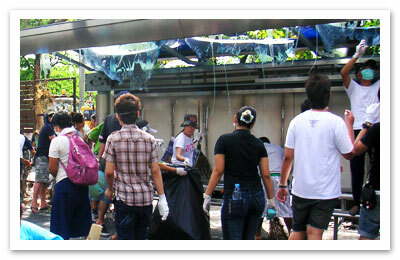 Volunteers helped cleaning a bus stop. 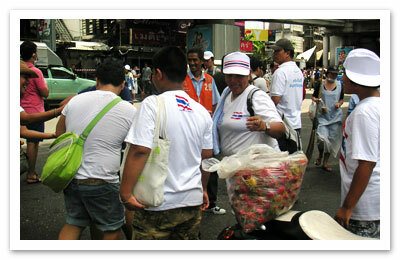 Volunteers joined BMA staff cleaning Raatchadamri street. In the activity, there were also groups of people and organizations gave the volunteers free foods, drinks, and some fruits like rambutan. This was a memorable picture of people in Thailand showing their spirit to the country. Free foods and drinks for volunteers. Free rambutans and big smiles! Do you have Thai friends? I think if you have talked to them via emails, chatting programs or social networking websites, you might have seen “5555555” or “555555+” characters. These might bewilder you what they mean. The number five is not any error or typo. It is only Thai Internet slang. Thai people pronounce the number five as “haa” so it sounds like “ha”. 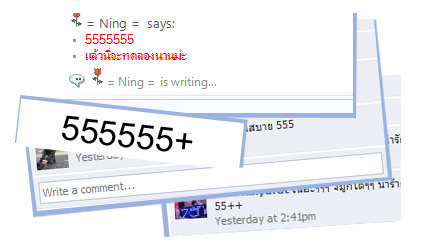 Therefore when Thai people would like to laugh while they are talking online, they will type “555” for “ha ha ha”. Many fives “55555555555” or many fives with plus sign(s) “55555555+(+)” can be used for LOL.